Ewein Bhd is a metal fabrication company which undertakes design and fabrication of sheet metals, moulds, dies, and tools. It operates through the following business segments: Manufacturing, Property Development, Property Management and Letting, and Others. Manufacturing segment involves in manufacturing of precision sheet metal fabricated parts, satellite antennas, precision plastic injection moulding products, and fabrication of moulds, tools, and dies. Property Development segment a major profit contributor for Ewein which comprise of property development, construction, and trading of construction materials. Property Management and Letting segment offers managing an office building, a heritage or cultural property, and car parks. 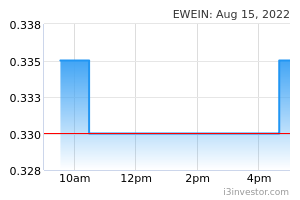 Major revenue contributed for Ewein from Malaysia. moneykj This counter already half dead. Go for Redtone. 507596689729039 12-3-19 SBB still working. Only tunnel case blustery affects the price. 6060 SBB if stop below 60 not smart lo. its a now or never event. 507596689729039 Opcom (Anak M), Eden (Anak M), Ewein (Anak L) semua ini Anak PH naik boom boom hari ini ! 507596689729039 Come on Ewein. Make a noise in the world of ' Invest Malaysia ' ! PH_better Undersea Tunnel more important not Penang Island Link(PIL) to overcome Penang Island traffic jam? MIDF PH counters no IBs' want to cover? Kesian lo. promised by Dr M n Ah Eng. 5354_ Wan Azmi interested in E&O 98 sen why 40 sen cheaper Ewein unwanted? Both major project nearby and in Penang island. 507596689729039 Wait until Penang tunnel catastrophe over. Hair by hair you will pull out the horse's tail. Undilah_DAP Tunnel better than Jho Low Equanimity? 507596689729039 Good news ! Spring in the air. ji bai ho se liao ! Private lift to own unit, where to find? edmen got momentum this morning! But those others construction courter may not really good Qr due to project stop on Jan-until now. rite here waiting for u.
Stephenloo what cost that u mean klmly2? 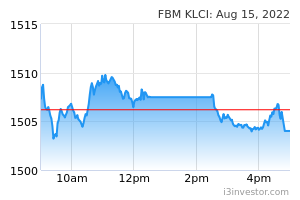 PH_better Undersea tunnel+ECRL under PH< RM 55-81 billion only ECRL under BN? Penang456 Undersea Tunnel why no news unlike Penang LRT and PIL? To me Tunnel is best to avoid Penang Bridge jam. Penang456 After Penang LRT, PIL next is Undersea Tunnel can go ahead?